OOTD - Burgundy Platform Sandals | La Petite Noob | A Toronto-Based Fashion and Lifestyle Blog. That dreaded F-word again: Fall. Not that the weather in Toronto would give any indication that a change of season is on it's way, but I've been in an autumn state of mind. A change of seasons is always the trickiest time in terms of dress, so what I like to do is to take familiar summer outfits and just switch out a few pieces for darker coloured items. For example, a black t-shirt and choker can completely transform the look of white culottes; and can we talk about these shoes? The platform on these burgundy beauties not only gives a retro-feeling, but also makes them incredibly comfortable to walk in. If this is what we can expect from Le Chateau footwear for fall then I'm excited! 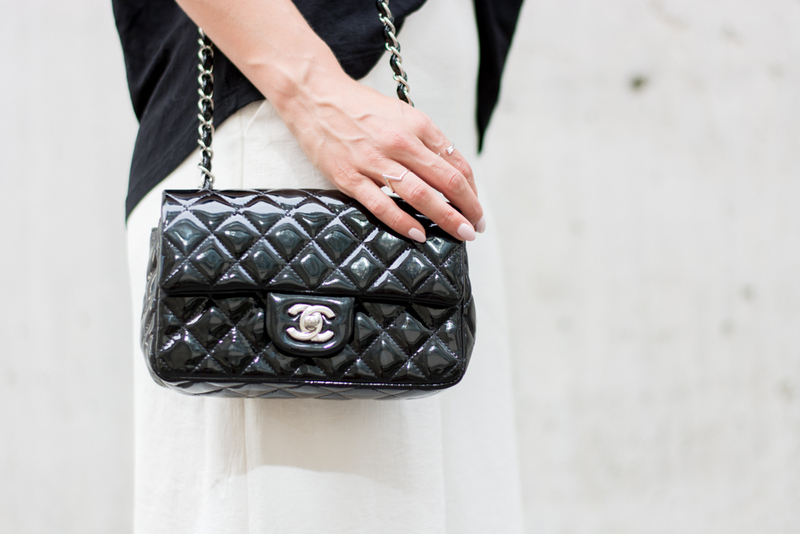 You spotted it: the cutest little Chanel mini. Remember my post on how to purchase pre-loved Chanel? Since that blog post I couldn't get the iconic handbags out of my mind. Well the ladies at Love That Bag really came through (again) and I picked up this black patent Chanel rectangular mini with silver hardware - nearly impossible to find in-store and at a fraction of the retail price! You guys, my days of purchasing designer handbags in-store may be over. I'm hooked! What do you guys think? Are you into mixing summer staples with cooler-weather classics? Are you excited for fall, or still basking in the heat of summer? Let me know! I LOVE these shoes! Such a great shade for Fall! They look amazing on you. So tall. Thanks Gabirella - SO tall! It was definitely a selling feature for the shoes LOL! Those shoes are killer, oh my gosh! Thanks Kierra - I love them too! Le Chateau always has killer shoes at a great price! Thank you! So glad that you like them. i'm gearing up for fall while trying to keep in mind it's gonna be hot for another month. i'm actually moving to toronto for 10 weeks starting the last monday in september and i'm trying to make sure i can make it through the 10 weeks everyday at school full-time with clothes! OHHH Toronto in the fall is the absolute best. You're going to have so much fun! You look stunning!! Love love this entire look. Thanks Alecia! I'm so glad that you like the look xo. These platform sandals are definitely a statement pair! SO beautiful and eye catching! This is such a gorgeous outfit, and naturally, I'm swooning over your gorgeous bag! love the look - the heels are such a great pop!